If you’ve seen the trailer, you know exactly what you’re getting into with this film. Detective Phil Philips is a down-on-his-luck puppet. He used to work for the Los Angeles Police Department, but now he is merely a private investigator. When two puppets from an old TV show wind up dead, Phil is forced to team up with his former human partner, Connie Edwards, to find out why. Unfortunately, Phil and Connie don’t exactly get along anymore, and the bickering duo soon find themselves in a race against time to protect the other former cast members before the killer strikes again. Now a movie likes Happytime tries to hook you in on it’s premise alone. Sesame Street puppets gone bad? That’s enough to grab an audience’s attention. But is it enough to carry an entire film? The short answer is no. The gimmick of having raunchy puppets eventually wears out. Thankfully, The Happytime Murders has a few positive traits working in it’s favor. The first thing anyone will notice is the film’s tone. Happytime may be a murder-mystery of sorts, but it’s a full blown comedy. The humor found in this movie isn’t so different than what you may find in something Sausage Party. It’s not trying to take itself seriously, it’s not a black comedy that can be dark and depressing at times, and it’s not even trying to disrespect the legacy of a show like Sesame Street. 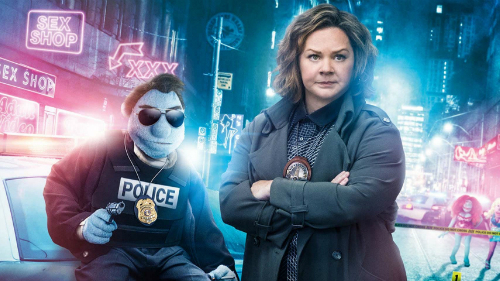 The Happytime Murders is just a movie that is trying to have some fun. The specific sense of humor may not be for everyone, but if you thought the trailer was funny at all, then you may end up also enjoying this movie as I did. Granted, some jokes do fall flat, and the funniest bits were probably shown in the trailer itself, but there are still a handful of laughs to be had. I personally found that the best jokes were those that made sense in this world. If humans had to interact with puppets as a sentient species, there are certain exchanges that would easily come across as humorous. In this way, the fictional world of Happytime actually feels fleshed out. The universe is also made all the more believable thanks to the spot-on voice acting and the excellent puppeteer work. The world-building even helps bring out themes on racism and prejudice. These themes may be overly blunt and obvious, but at least a raunchy comedy like this one decided to have some underlying message. Based on the trailer alone, I never would have thought that I would be commending Happytime for its thematic elements and notable world-building, but here we are. So with a humorous tone and an established world, the rest of Happytime hinges on the chemistry between it’s co-leads. Melissa McCarthy is fine as Connie Edwards, but she really just sticks to her usual shtick here. There’s really no difference between her character in this film from her character in The Heat. Conversely, I was really impressed with her partner Phil Phillips, which – I know – is a puppet. I was just able to empathize with him and his story. He carries a lot of weight on his shoulders, and the guilt he carries the bulk of the dramatic tension in the film. Bill Barretta did an excellent job making this character come to life. McCarthy and Barretta had great chemistry together and were able to riff off of each other with ease. It’s just a shame that their character arcs were extremely fast and predictable. Though I enjoyed all of the other puppet characters, I was let down by the film’s human cast. Elizabeth Banks is in this movie, for example, but her presence is completely wasted. Despite the importance that the narrative tries to force upon her, her character adds nothing to the story. Joel McHale – of Community fame – is quite annoying, while Leslie David Baker – from The Office – feels bored or disconnected from the movie entirely. I enjoyed Maya Rudolph’s delightful presence, but that’s about it. 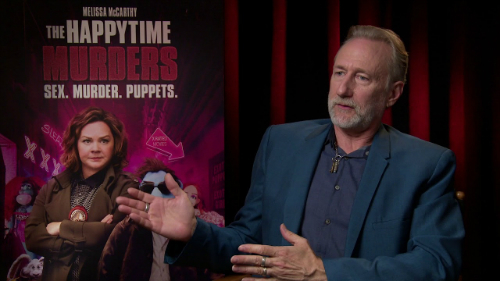 I have to give my appreciation of the puppet work to the director himself, who is none other than Jim Henson’s son, Brian Henson. I was honestly surprised when I found out that Henson wanted to make a Rated-R puppet film, especially after hearing that Sesame Workshop filed a lawsuit against the production, but I respect his decision to do so. Puppets shouldn’t necessarily have to be beholden to one specific genre. And even if the film isn’t being critically praised, people are talking about puppets again. Henson had a fun idea that brought puppets back into the public consciousness, and I can’t deny that I enjoyed it. Unfortunately, The Happytime Murders never gets any deeper than its raunchy premise. It doesn’t deconstruct puppet films, the story itself is pretty average, and it tries too hard to go for shock value (which gives the film a jarring tone at times). But this doesn’t necessarily make Happytime a bad film. Brian Henson brought some style to the murder-mystery/ buddy cop genre, and the result was a fun time. Even if you get sick of all the puppet-based jokes, the 90-minute runtime makes the film fly on by. I highly doubt Happytime will ever get a sequel, but I would love to see more films just like it.